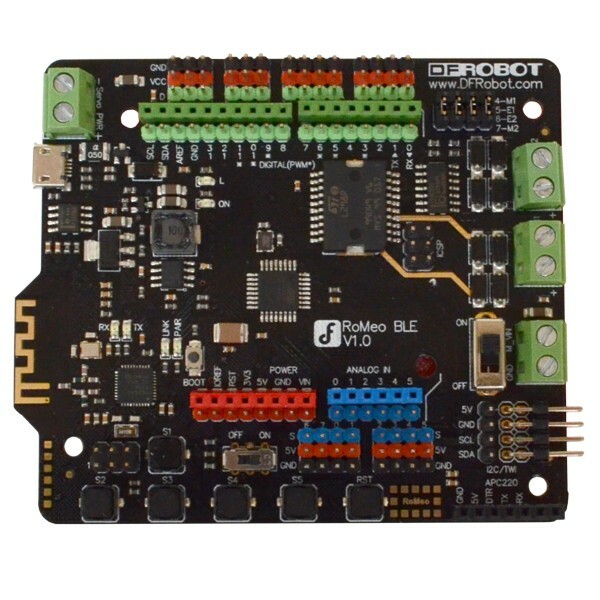 The Romeo BLE Robot Controller is an Arduino Uno compatible microcontroller with built in Bluetooth 4.0 and motor driver circuits. 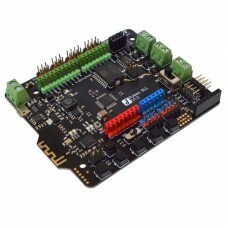 Romeo All-in-One Arduino compatible microcontrollers are designed for use in robot projects. It features a built in Bluetooth Smart wireless connectivity and integrated dual motor driver. This robot controller uses an Atmel ATmega328p as the main microcontroller. It comes preprogrammed with an Arduino bootloader for compatibility with the friendly Arduino Uno platform. A secondary Texas Instruments CC2540 microcontroller handles the BLE Bluetooth Low Energy communication services. It comes preprogrammed with a firmware that supports transparent serial over Bluetooth and a AT command interpreter. Both microcontrollers are full programmable. 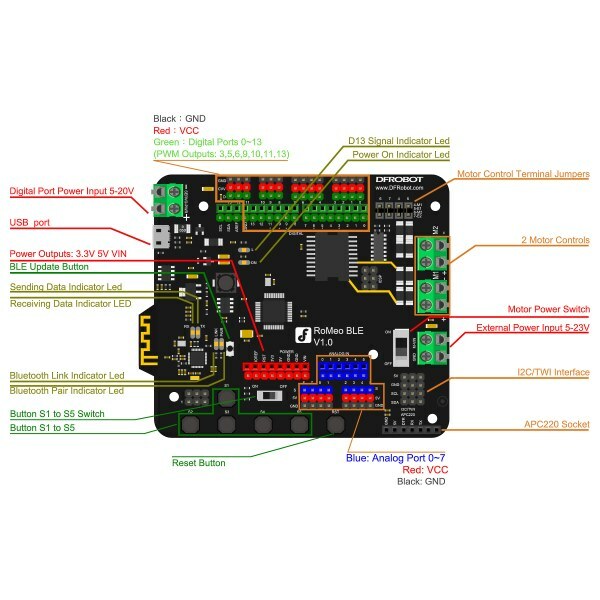 The Romeo robot controller contains a built in L298 dual channel motor driver chip. This motor driver can be used to drive two 5-23 volt DC motors at up to 2 amps. Screw terminals are provided for connecting two motors and an external motor power supply. The Romeo BLE microcontroller board also has a large number of pin headers to simplify connection to your robot project. A full set of 3 pin analog and digital GPIO headers provide access to signal, voltage and ground lines at each connection to simplify wiring arrangements. The digital GPIO headers can also be used to drive servos and a screw terminal can provide an external servo power supply. A full set of Arduino Uno compatible headers provide allow you to choose from a large number of Arduino compatible shields for expansion. A triplet of I2C connectors is also provided. Additional features include five optional user push buttons, a reset button and a number of LED status indicators to assist with diagnostics. The optional user buttons are conveniently wired to a single analog input. They can be enabled or disable via a slider switch. This microcontroller is Arduino Uno compatible and works with Arduino libraries, shields and IDE.